As many know, the sole impetus behind launching this blog was to share good eats and recipes with friends and family. Two years later, not much has changed. I still don't plan on making a career of food-blogging, and I still don't gain any revenue by your reading my posts. But I still thoroughly enjoy this hobby, and it excites me to learn that you enjoy and appreciate it, too! One thing that has changed is the unexpected growth in audience and support. From two complete strangers name-dropping my blog at Urth Caffe earlier this year (I will never forget that moment and how I nearly peed in my pants as a grown lady!) to having friends talk about my blog with pride, I'm blown away by how my humble site has caught the attention of folks from all over the world. What's more, with all this extra attention my blog has garnered, I've been invited to a few local "foodie events." 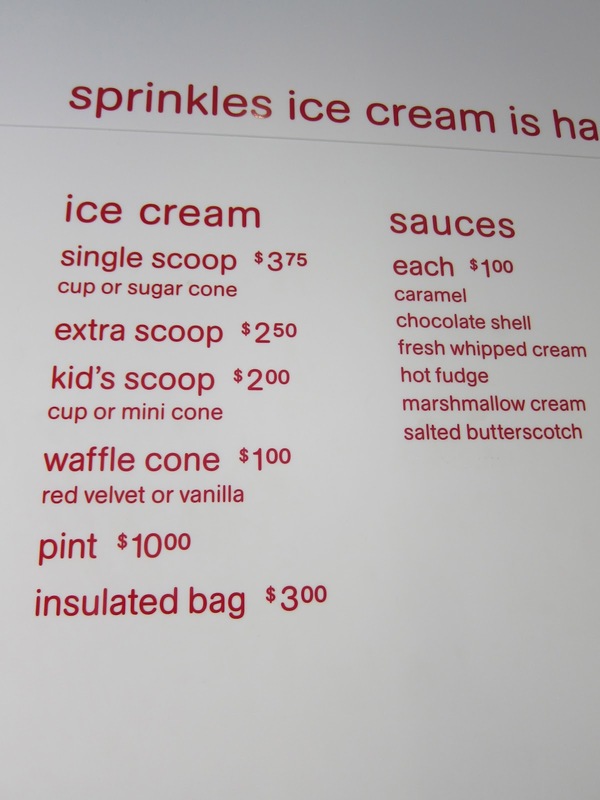 Most recently, I was invited to join Sprinkles' pastry chef and co-visionary, Candace Nelson, for a Champagne and Ice Cream Happy Hour at Sprinkles Ice Cream (WHAT? I know). 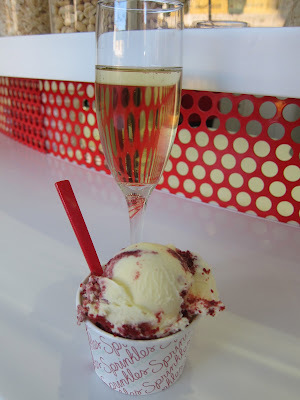 I sampled 13 different ice cream flavors, with a glass of champagne in hand. To make matters even more special, I got a chance to chat with Candace and her partner (in business and in life), Charles about their work in making an impressionable mark in the cupcakery world. 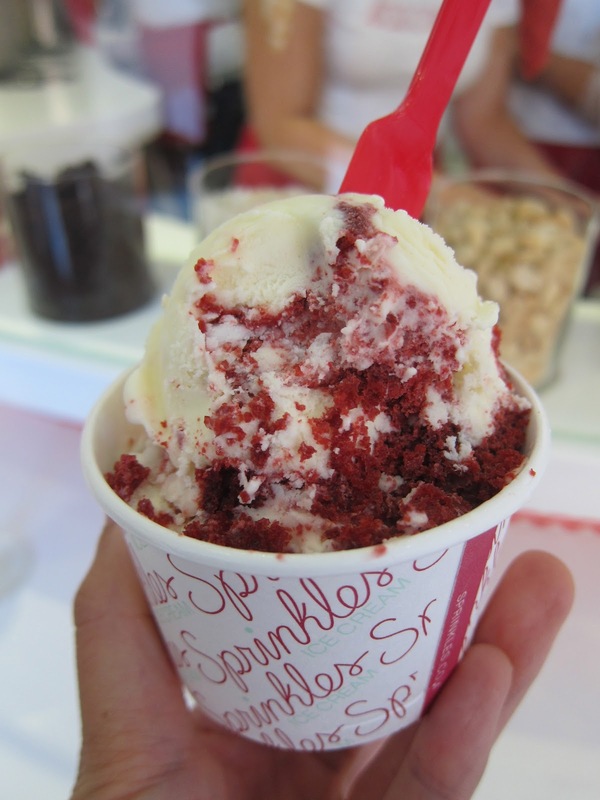 With Sprinkles Ice Cream, C+C highlights a classic, American-favorite dessert. But this time, it's presented in a way that triggers both the comfort of familiarity and adventure of newness. 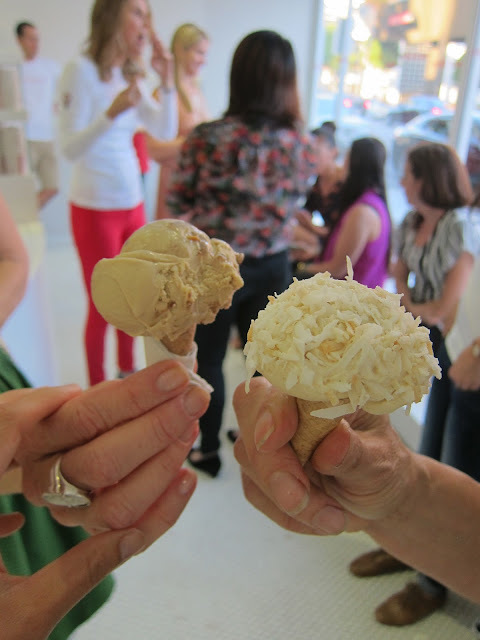 Their flavors, made from organic ingredients, can tempt even the lactose-intolerant. Your hips may resist, but your taste buds will thank you. Red dot indicates flavors in store. Flavors rotate every few weeks. I kicked off the night with a cup of red velvet cupcake ice cream. 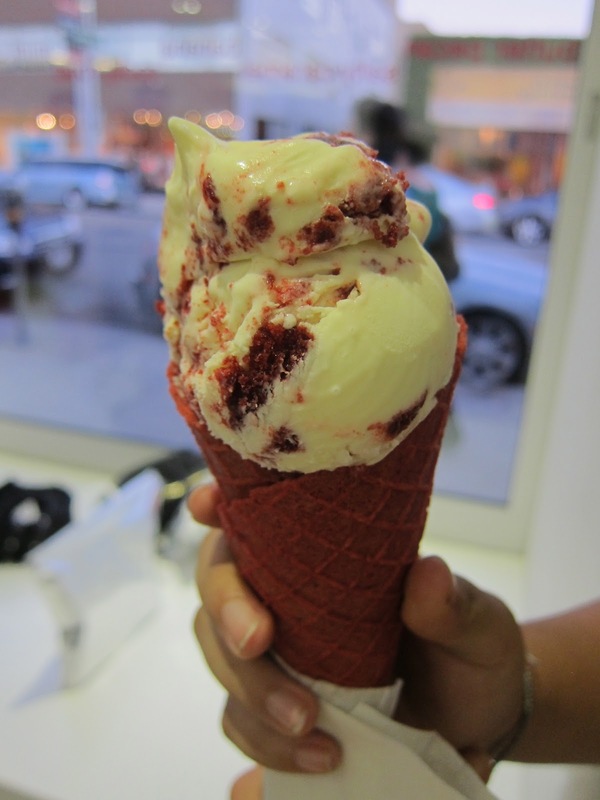 I stayed away from the red velvet cone only because I thought the duo would be overly, well, red-velvety. I regretted this so much that I asked to photograph a fellow patron's red velvet on red velvet combo. Just go big or go home, guys. Cone or no cone, the ice cream speaks for itself. I was most impressed that the red velvet cupcake chunks, though intermingling with the cold and creamy ice cream, remained both soft and flavorful. The cream cheese frosting infused in the ice cream did not overpower the red velvet flavor, and most surprisingly, I didn't find the ice cream overly sweet. 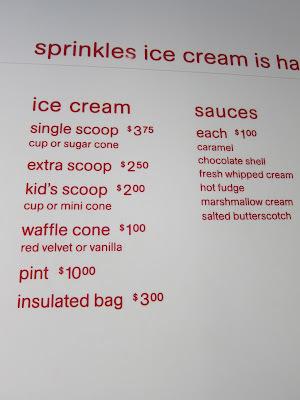 It's no wonder this is one of Sprinkles' top-sellers. Although red velvet cupcake flavor was good, my favorite was the Coffee Fudge Almond (the toasted almonds are what seal the deal) with Rocky Road as a close second (must be the toasted almonds again). But whatever you get, you're guaranteed a creamy, organic concoction of deliciousness. In other words, you can't really go wrong. 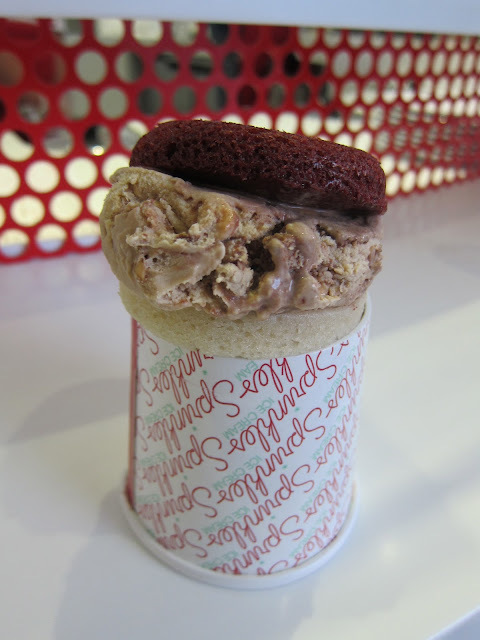 Last, but not least, Sprinkles Ice Cream offers two brilliant things that alone should convince you to visit the shop: Ice cream sandwiches! They have ice cream cookie sandwiches, which is nothing too novel. 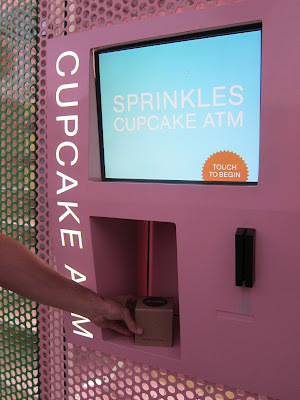 But they also have something they call the "Sprinkles Sandwich," which involves two fresh cupcake tops (choice of vanilla, chocolate, and red velvet) in place of cookies. What result? One heck of a mess, but one heck of a happy Doah! As for the design of the place, the white interior with splashes of red is like its ice cream: simple and pure with an unexpected, but inviting twist. Most notable was a wide bench that allows patrons both inside and outside of the store to lounge and enjoy their treats. Sprinkles Cupcakes created a loud enough buzz about cupcakes in LA, and their take on ice cream will likely be the same. So indulge a little and go check them out!